Saddam Hussein’s aide, Tariq Aziz, has died in an Iraqi hospital at the age of 79, officials say. 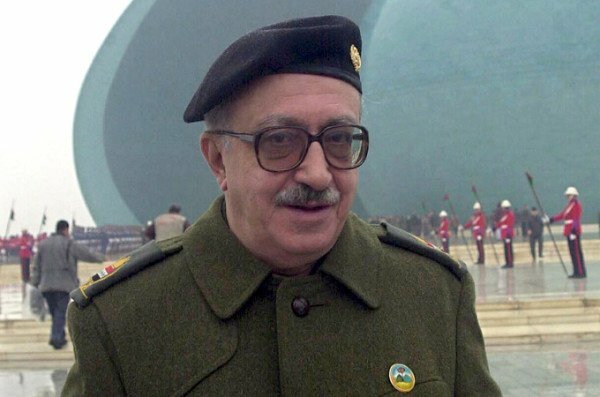 Tariq Aziz served as Iraq’s foreign minister and deputy prime minister and was a close adviser to Saddam Hussein. Tariq Aziz surrendered to US troops in 2003 shortly after the fall of Baghdad. A local health official told reporters that Tariq Aziz was taken to hospital from prison after suffering a heart attack. Initial reports said he had died in prison. Tariq Aziz, who was known for his black-rimmed glasses and love of cigars, first came to prominence while serving as foreign minister during the first Gulf War in 1991. As a Christian in a mainly Sunni Muslim government, Tariq Aziz was not considered a member of Saddam Hussein’s innermost circle. A fluent English speaker, Tariq Aziz played a vocal role before the US invasion of Iraq in 2003, meeting Pope John Paul II in the Vatican to call for peace. However, when Baghdad fell, Tariq Aziz’s lack of influence was reflected in his lowly ranking as the eight of spades in the US military’s famous “deck of cards” used to identify the most-wanted players in Saddam Hussein’s regime. In 2009, Tariq Aziz was sentenced to 15 years for the execution of 42 Iraqi traders who had been accused of manipulating food prices while Iraq was subject to international trade sanctions. Five months later, Tariq Aziz was sentenced to another seven years in prison for his role in the forced displacement of Kurds.